The Upper Peninsula of Michigan, while not exactly the middle of nowhere, is, by any definition of the word, remote. Native yooper and composer Jesse DeCaire began writing and recording music in 2005, attempting to capture the soundtracks for the desolate movies playing in his head. 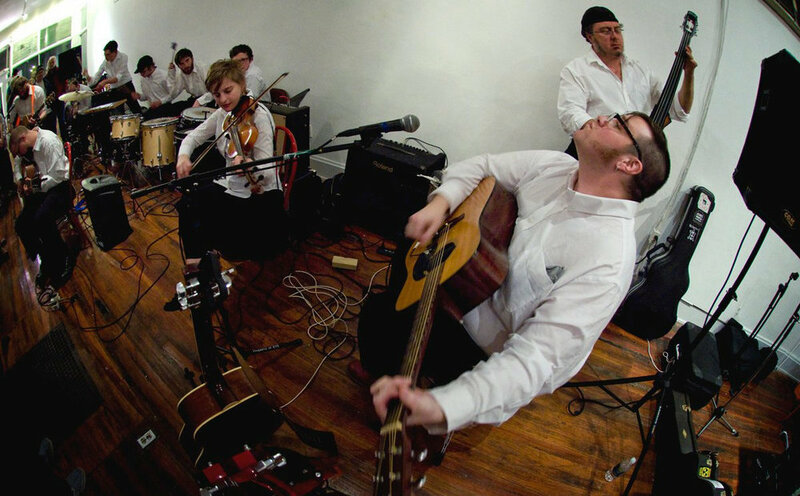 In performance, The Terminal Orchestra, headlining our March 9 GateSound concert at the historic Gates of Heaven synagogue in James Madison Park, harness and amplify both the quiet and bombast of DeCaire's compositions. The Terminal Orchestra's instrumentation often includes up to seven drummers and percussionists as well as a string section, stand up bass, and guitars. The sheer force and volume makes one wonder what Mogwai might sound like without amplification. The Terminal Orchestra's contemporary classical may well be a provincial Stravinski, but it also veers towards the longing soundscapes of artists like Nick Cave and Warren Ellis, and William Basinski; the dense single-mindedness of composers like Glenn Branca; and the epic scope and sense of desolation present in the work of the Ennio Morricone. They'll be playing here behind the recently released album Leave Home, Rabbit, a composition cycle inspired by Watership Down. But before this powerful display of acoustic instrumentation, the night will start out with two Wisconsin-based artists who explore the abstract reaches of electronic music. knowsthetime is the production moniker of Ian Carroll, who divides his time between Milwaukee and Madison and previously worked under the name *hitmayng. Carroll is probably best known for his work in hip-hop, having created beats for Wisconsin artists including CRASHprez and co-founded the Catch Wreck label. But his work reaches across the electronic spectrum. On the 2014 collaborative release Sleepers, Carroll showcased four of his ambient tracks. He'll be delving further into that territory here with a new set and an unconventional approach: He'll be running a bunch of different cassette loops through effects pedals and a sampler. This material will be new to my ears, but he did share a work-in-progress clip with me that sounded promisingly dynamic, strange, and scratchy. And that's what I like about Carroll: Whatever idiom he's working in, he brings to it a flexible musicality and a willingness to experiment. His set here will be accompanied by live visuals from Madison-based filmmaker Aaron Granat. First up will be Noxroy, the solo project of Andrew Fitzpatrick, who's also known for his work in All Tiny Creatures, Cap Alan, Volcano Choir, and Bon Iver. The music he makes as Noxroy tends to revolve around deeply textured modular synth and gorgeously processed-beyond-recognition guitar. The last proper Noxroy release, 2014's Anverloss, focuses on the modular synth side of things, and it illustrates Fitzpatrick's command over a far-flung and often disorienting field of sound, from the dissonant ringing of "Bram" to the shattery-squashy attack of "Calculus Almond" to the comparatively serene drones of "Manuscript." Although we're still waiting on new recordings from Fitzpatrick, he's continued to play live over the past few years, and I can safely say that no two sets have been quite alike. March 19: Sun Speak, Tony Barba, Mahr. Arts + Literature Laboratory, 7 p.m., all ages, $8. April 18: Jon Mueller, Jason Kahn, Sheba. Arts + Literature Laboratory, 8 p.m., all ages, $8. April 22: Record Store Day Party with Wood Chickens, No Hoax, DJ Quinley and DJ Joel. Bandung Indonesian Restaurant, noon, free.